Our team of tour guides are all highly trained, knowledgeable, attentive and professional individuals who are committed to providing the highest possible standard of customer service. We regard our guides as the backbone of the company. Their knowledge of the local area, their attention to safety, and their ability to make sure everyone in the group has a fantastic day on the water has been paramount to our continued success. Hugh is an award winning tour guide who has been fishing the waters of the Cobourg Peninsula for over ten years. Fishing for Barra, Mangrove Jacks, Golden Snapper, Coral Trout, GT’s, and mudcrabs are always high on his list. With a love for wildlife and the local indigenous culture, Hugh’s fishing trips are often much more than just wetting a line. Aaron grew up in rural Victoria and studied in Melbourne; completing a Bachelor of Business (Entrepreneurship) at RMIT. 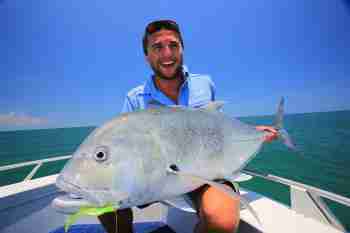 With a passion for the outdoors, and experience as a park ranger, Aaron made the permanent move to Darwin in 2009 to run Cobourg Fishing Safaris with his brother, Hugh. Today Aaron is based in Darwin and managers the day-to-day operations and marketing of the company. When he's not working you'll find him out bush exploring new area's of the NT, often with a fishing rod in his hand! 'Trav' is based at Cobourg Coastal Camp and shares the role of skipper with Hugh during the dry season. He has extensive experience captaining a range of vessels and has spent most the past 20 years on the water. He is an expert fisherman and a highly respected crabber, known to many as the 'crab whisperer'. 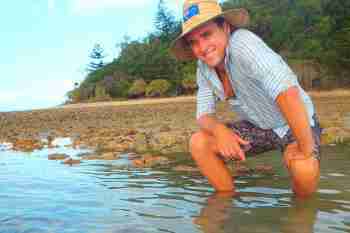 Dave is well known territory guidewith an extensive knowledge of Northern Australia’s heritage, geology, nature and fishing. Previously a qualified chef, Dave frequently finds himself catering for fishing groups at Cobourg Coastal Camp. In-between meals, Dave is always eager to get out on the water working as deckhand and fishing instructor.